Hippopotamus time is here again. I met my once-a-week deadline, but so far I haven't turned into the manic song-recording machine I need to be in order to finish this project by the 31st of July. I'll play it by ear through the coming week, and keep that goal in mind but give myself extra time if I need it. Especially since the recordings are, on the whole, improving, I see no reason to foist three pieces of crap on the world in one week. I say "on the whole," because I was happier with my output this time last week. My muse really seems to perk up when I sing, but I thought I could fool her by just whistling. No dice. On the other hand, this piece is still a reaction to last week. I mentioned in that post, referring to generally dark tone of these recordings, that "I should try and make something cheerful just to see how it ends up perverted." I took that as a challenge and tried to make something sweet. It still ended up melancholic, but at least there is no undercurrent of menace. I call this piece "Gaggle of Grackles." 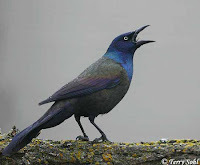 I have no idea what the actual call of the grackle sounds like, so my whistling bears no relation to any real bird. But when I conceived the main banjo part I was sitting by a stream where a whole mess of grackles were bathing. I changed "mess" to "gaggle" for the sake of alliteration and the rest is history. The whole thing has a pretty natural vibe - I was going to put some of my field recordings in the background, too, but my multitrack and my computer aren't on speaking terms, so I made the nature noises myself. That's ultimately to the good, I think. I also fumbled around with plenty of delay - strange how technology can be so helpful in the evocation of nature. Nice track...I like the soothing hillbilly playfulness of this one. And I think the decision to make the nature sounds yourself (hey, wait...do you not consider yourself a part of nature?) was a good one. I'm not sure I would have liked authentic nature sounds. On an unrelated note, do you know the music of Kev Hopper? He's a saw player, and I think you'd like a lot of his stuff. He was in an 80's band called Stump who released one album that I know about ('A Fierce Pancake') that I'd call (partly for sentimental reasons) one of my favorites ever. "Grackles" had a feel that reminded me a bit of Kev Hopper's solo stuff. Not the Stump stuff though.